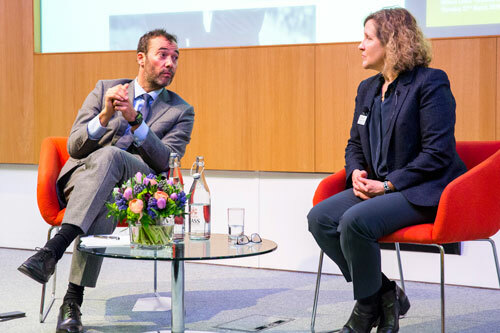 Cass Business School recently launched Lessons in Leadership, a unique online learning programme in partnership with Dow Jones. Professor Marianne Lewis writes about the programme and what she learned from it. "Our students aren’t the only people to learn a great deal from Lessons in Leadership, a unique online programme featuring some of the world’s leading CEOs, that has been developed by Cass Business School, Dow Jones and US Edtech entrepreneur Peter Price. As well as leadership we at Cass have learnt more about curriculum innovation and learner engagement as well as how partnerships can accelerate that. "As part of the 50th anniversary of the Cass Business School two years ago, then Coca-Cola Company CEO Muhtar Kent, one of our graduates, agreed to be interviewed by William Lewis, CEO of Dow Jones and Publisher of The Wall Street Journal and me, about the lessons he had learned during his career. "The exchange with Mr Kent, now Chairman of the company, was fascinating in many respects - from his start working on Coca-Cola trucks at 5am as part of the management training programme to his rise through the ranks, leading operations in the former Soviet Union and other regions across the globe. But one lesson in particular stood out for both of us: his emphasis on the importance of being humble. "This sparked an idea: Why not offer an accessible online higher education course featuring the insights and perspectives of the world’s leading global business leaders - combined with complementary yet challenging curriculum devised by Cass academics? "At that time I was lucky enough to meet Peter Price, of PTwo Publishing who had experience of novel online education in the US and this coincidence led to Cass’s recently launched joint venture with Dow Jones. Lessons in Leadership – CEO Masterclasses in Strategy isa hybrid of the traditional online course. Designed with sustainability in mind, a tuition fee is charged unlike the increasingly popular MOOC, or massive open online course, which is usually free and open to all. "Lessons in Leadership is a 16-week programme offering nine individual masterclasses that combine video content provided by academics at Cass with real-life case studies -- drawn from conversations that William Lewis conducted with leaders of major global businesses. "The ambition is to help students of business (whether currently in management positions or in education) think strategically rather than only focus on day-to-day management priorities. The lessons are powerful: one of the primary lessons, expressed by several of the business leaders interviewed for the course, is the need to drive diversity and inclusion in decision-making. The CEOs also unanimously agreed, often in very personal and moving terms, that a wealth of experience and having the ability to recognise and apply a multiplicity of perspectives is essential to innovation and superior performance. "Dame Inga Beale, the first female CEO in the three century-plus history of Lloyd's, the global insurance market, spoke about breaking the glass ceiling. Tech Mahindra CEO, CP Gurnani, offered that many of the Indian group's successes are tied to an advisory board of young millennial and post-millennial employees. Sir Martin Sorrell, the long-time CEO of WPP, the world’s largest advertising company, spoke about the imperative of bringing his 200,000-plus employees together to ensure a uniform client experience across all global markets. And, of course, Coca-Cola’s Chairman spoke eloquently about his company’s primary sustainability focus on the “Three Ws” of women, water and well-being. "Their emphasis on diversity could not be more timely, and resonates clearly with the aspiring and rising professionals and the students of business management that this programme is designed to reach. It is early days, but initial feedback from students around the world is very encouraging. While much of the interest to date has come from the US, UK. and Canada, we are seeing students sign up from as far afield as India, Kenya and South Africa. "Creating this course has required us to spend quality time with CEOs and that has yielded fascinating, immediate insights into the qualities, skills and knowledge it takes to lead a modern global business. It also taught us at Cass that working with new partners such as Dow Jones can bring significant outcomes for content and product innovation and to achieve those much more quickly. This process of rapid innovation has enabled us to diversify our curriculum and its delivery so that we can provide additional learners around the world with powerful ‘of the moment’ learning opportunities. If there is a secret formula for success in business, it strikes us that CEOs with a strong sense of purpose and ambition tend to win the day. Many may be too humble to mention that of course." Professor Marianne Lewis is Dean of Cass Business School.